Plastic Badge Patch "JFK - Presidential Library&Museum"
Plastic Badge "John F.Kennedy - Presidential Library & Museum" bought at John F. Kennedy Presidential Library and Museum in Boston. Plastic Placemat "First Ladies of the United States of America"
Plastic Placemat "First Ladies of the United States of America"", bought at the Museum Store of "The Sixth Floor Museum" at Dealey Plaza, Dallas. Plastic Placemat "Presidents of the United States of America"
Plastic Placemat "Presidents of the United States of America"", bought at the Museum Store of "The Sixth Floor Museum" at Dealey Plaza, Dallas. 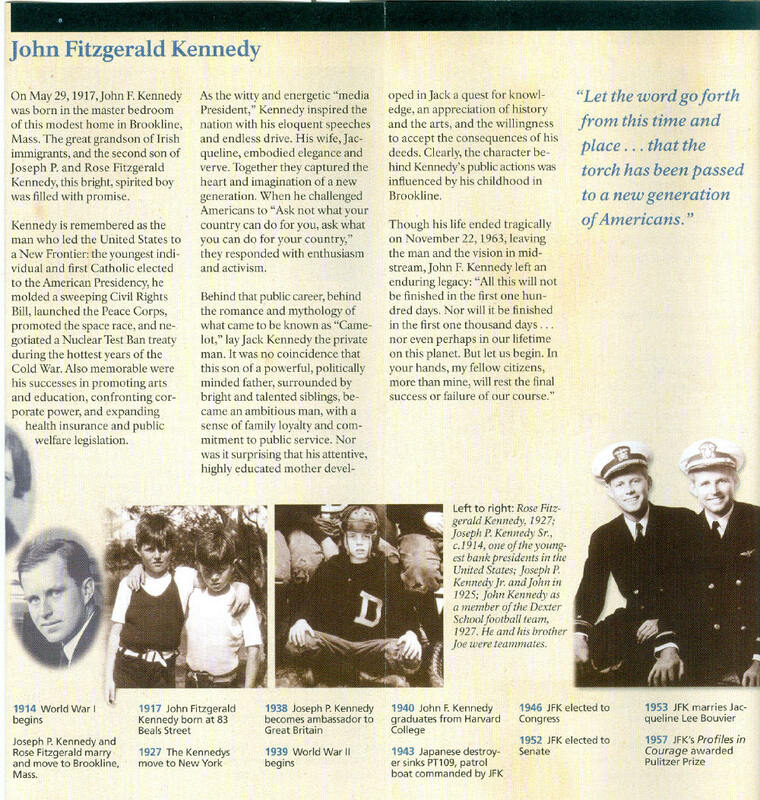 Brochure "JFK - National Historic Site - Visiting Brookine"
Rose and Joseph Kennedy began their life together in Brookline,Mass., where they joined their early hopes and ambitions to the promise of this vibrant and growing community. For 10 yrs these neighbourhood streets linked the daily life of John Fitzgerald Kennedy to those of neighbours, friends and schoolmates. Much of the Kennedy-era streetscape is preserved; this map guides in the footsteps of a young boy whose future course encompassed the world. Brochure "JFK - National Historic Site"
8-page brochure (in French) of the house in Brookline (Boston) where JFK was born in May 1917. US mini-poster for the tv movie "Killing Kennedy". "Killing Kennedy" is 2013 American television film, based on the 2012 non-fiction book of the same title by Bill O'Reilly and Martin Dugard, and starring Rob Lowe as United States President John F. Kennedy and Will Rothhaar as Lee Harvey Oswald. It premiered in the US and Canada on National Geographic Channel on November 10, 2013, followed by the various European National Geographic channels a few days later. Postcard 1961 - "President John F.Kennedy and family"
"President John F.Kennedy and Family"....Mrs Jacqueline Kennedy with their children, Caroline and John Jr. Published by A.A.A. Novelty Co, 903 Pennsylvania Ave. N.W. Washington, D.C.
Postcard 1963 - "In Memoriam President John F.Kennedy 1917-1963"
Original 1963 In Memoriam Postcard. John Fitzgerald Kennedy" - 35th President of the United States. May 29,1917 - November 22,1963"
Postcard "Arlington National Cemetery", bought at Arlington National Cemetery, Arlington, Virginia. Arlington Mansion and 200 acres of ground immediately surrounding it were designated officially as a military cemetery June 15,1864 by Secretary of War Edwin M.Stanton. Veterans from all the nation's wars are buried in the cemetery, from the American Revolution through the Iraq and Afghanistan. Pre-Civil War dead were reinterred after 1900. The nation watched and mourned when the President of the United States, the youngest ever, was buried at Arlington National Cemetery on November 25,1963. Postcard "The Eternal Flame", bought at Arlington National Cemetery, Arlington, Virginia.